With sewage treatment costs rising and many city systems strained to the breaking point, city officials are taking a closer look at streamlining existing plant operations and sewer systems. One way to make treatment plants more efficient and cost effective is to eliminate rainwater and other sources of run-off from the sewer system. LFM’s RainGuard Inflow Protector solves the problem of infiltration into the sewer system through manholes. On an average rainy day, a manhole can allow anywhere from 3,000 to 12,000 gallons of rainwater to enter the sewer treatment system. The RainGuard Inflow Protector reduces sewage treatment costs by reducing the amount of rainwater and other run-off from entering the treatment system. Odors that come from a manhole can make the air we breathe rather unpleasant. The unique design of LFM’s RainGuard Inflow Protector stops odors from rising out of a manhole. The RainGuard Inflow Protector carries a full one-year warranty against defects and workmanship. At LFM we stand behind the products that we build. The RainGuard Inflow Protector and its associated components are manufactured from a corrosion-proof material called acrylonitrite-butadiene-styrene (ABS). This material is a high-impact, high-grade material manufactured under ASTM Specifications D-256 (method A), D-638, D-790, D-785, D-648 (method A), and D-635. The RainGuard meets or exceeds each of these strict requirements. Its anti-corrosive nature makes it suitable for the harshest of sewer atmospheres. The RainGuard is impervious to such common sewer gases as Hydrogen Sulfide and dilute Sulfuric Acid. The RainGuard Inflow Protector comes with a pressure-sensitive adhesive gasket that is placed under the rim of the protector. The gasket is made of a high-quality closed cell neoprene, which is designed to give a long lasting bond in either wet or dry conditions. Our RainGuard Inflow Protector can be built with many different options to serve your specific needs. LFM can install a gas relief valve, a strap, or a vent onto the inflow protector. The gas relief valve is designed to relieve gases at a pressure of 1 psi and have a water leak-down rate of approximately 5 gallons per 24-hour period. The RainGuard Inflow Protector can be built with handy straps attached, making access to the manhole easy. We build RainGuard Inflow Protectors in many different diameters and with many combinations of options to fit your specific requirements. 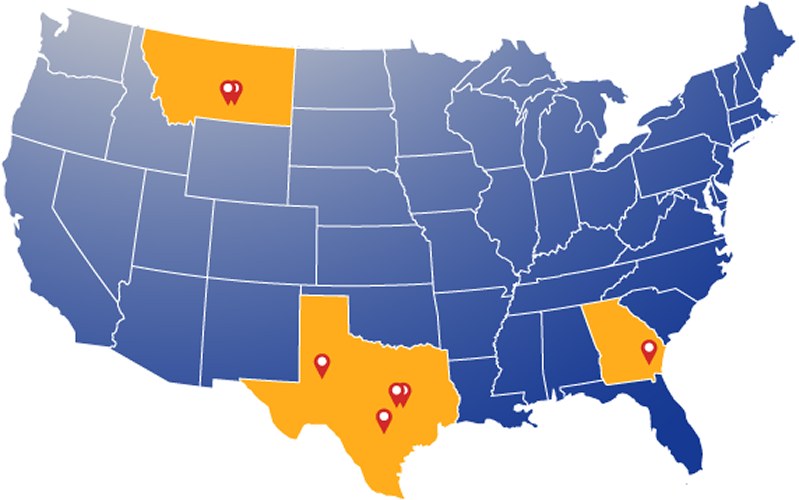 Contact your LFM sales representative to find out which options and which size best fits your needs. Remove the existing manhole cover. Clean the manhole rim or flange of any dirt or debris, to insure accurate measurement. Locate the CLEAR OPENING of the manhole rim. This is the INSIDE DIAMETER measurement (ID) as shown in the diagram (at right). Take two or three readings along the inside diameter circumference and record the smallest measurement to the nearest eighth of an inch. Locate the outer edge of the manhole rim. 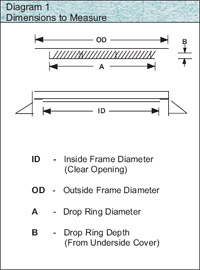 This is the OUTSIDE DIAMETER measurement (OD) as shown in the diagram (at right). The OD measurement and the bottom of the manhole cover will have the same dimensions. Take two or three readings along the outside diameter circumference and record the smallest measurement to the nearest eighth of an inch. Provide dimensions A and B on the cover as shown in the diagram below. Please indicate the specific type of manhole frame and cover that you have, i.e. standard (heavy or light duty), locking, boltdown, watertight, etc.’ along with the name of the manufacturer, and if possible, include a drawing. Refer to Diagram 1 on right for critical dimensions which are required when ordering LFM RainGuard Inflow Protectors.